M/S. SNAP NATURAL & ALGINATE PRODUCTS LTD.,Ranipet, Tamil Nadu came into existence in the Year 1979. It started its operations in the SIPCOT INDUSTRIAL ESTATE at Ranipet, Tamil Nadu in the year 1980. It manufactures Alginic Acid and its various salts such as Sodium Alginate, Potasium Alginate, Calcium Alginate, Ammonium Alginate etc., from the Brown Algae. It procures the Brown Algae Sargassum and Turbeneria species from the Gulf Mannar in South India during the season July to December every year and stores for the year after the post harvest treatment. SNAP originally obtained the manufacturing technology for the alginates from M/S. EXCEL in the year 1979 and set up its operation in 1980. With its in house R&D efforts it made continual improvements to the process, constantly upgraded the technology and emerged out as a world class manufacturers of alginates. SNAP is the pioneer in manufacturing food and pharma grade alginates in the country. Now it caters the need of world standard alginates to various industries such as Food, Pharma, Textile, Rubber, Welding Electrodes, Ceramic Glazing, Dental Impression Molds etc. Its manufacturing activities are aligned to the requirement of International standard ISO:for Quality Management System and ISO 14001-2004 for its Environment Management System. Its Food grade alginates are as per International Standards E 400 E40x and the Pharma grade products comply with the requirements of I.P., B.P. and U.S.P., requirements. Seaweeds of alginophytes species contain naturally occurring alginates. The weeds are treated with mild acid for removal of unwanted salts in the weeds, it is then treated with alkali for conversion of alginic acid into Sodium Alginate. The digested pulp is then diluted and settled and sodium alginate recovered. The purified alginic acid is then converted into the desired salts and then dried. The dried salts of alginates are pulverized and then packed. SNAP generates two categories of discharges (waste) from its process. 1. Solid Discharge: The remains of Sea Weeds after the extraction of alginates. 2. Liquid Discharge: The wash water of the sea weeds which is acidic and essentially contains organic TDS, sea salts and sea sand. By developing suitable water recycle techniques the generation of liquid discharge is reduced to below 30 KLD from 750 KLD. The liquid discharge is acidic in nature with a pH of about 1.8, at a normality of about 0.08.N. It contains fine sea sand, Inorganic and organic TDS together at about 40,000 ppm . The acidic water was neutralized with caustic soda, settled to remove the TSS and evaporated on solar evaporation ponds. The dried solids were recovered from the solar evaporation pond, collected and stored in a secured land fill. Improved Biological Method: With the research support from Dr V Sivasubramanian and his team Phycoremediation technique was employed for the treatment of liquid waste. * RCC tank having cross section area of 1200 sq m, 1 metre height and volume of 1200 KL. * The tank is provided with a AC sheet slopped roof so that the rain water does not enter the tank. * The AC sheet is painted with black bitumen to improve the absorption of Solar radiation. * Masonry slopped floor of about 3000 sq m area painted with black bitumen is provided adjacent to the tank such that the effluent water from the tank may be drained over the slopped floor by gravity. * The tank is charged with blue green alga- Chroococcus turgidus which is a naturally occurring algae. * The acidic effluent water from the plant is discharged in to the tank. The algae utilize the nutrients such as organic TDS and minerals, produce alkalinity and neutralize the water. * The effluent water from the tank is discharged over the drying platform such that the water runs evenly as a thin film over the entire 3000 sq m.
* The water is collected at the end of the charging platform and pumped over the AC sheet roof of the tank where it is distributed evenly thro’ suitable header such that the water is again flowing over the black painted AC sheet evenly as a thin layer, collected at the lowest end in a trough and put back in to the tank. * During rainy time the circulation of the effluent water will be stopped, all the water will be pumped into the tank. * The circulation of the effluent water as a thin layer over the black coated surface increases the evaporation and the aeration of water enhances the Phycoremediation activity of the algae. The gentle distribution of water thro’ properly designed headers prevent the drifting of effluent water to the surroundings. The Algae research team from PERC headed by Dr V Sivasubramanian delivered algal technology to SNAP alginates for cleaning up their industrial effluent discharge. The results were dramatic both financially and also qualitatively. This technology goes far in the fulfillment of corporate responsibility to the society and environment. Phycoremediation is a sophisticated and multi faceted effluent treatment process. And each case of application will address a different set of operational imperatives. The summary below depicts the business case for this technology in the case of this particular application. Rs. 50 lakhs spent for caustic soda annually is saved (100%). Evaporation of effluents deposits sludge. That needs to be buried in a land fill. About 290 tonnes of sludge produced annually from this treatment. Algal remediation produces a nutrient rich, commercially valuable fertilizer that is highly demanded in the market. There is no residual sludge. Additionally revenues from the sale of algal biomass fertilizer. 3000 sq mtrs of tank for containing and evaporating the effluent. 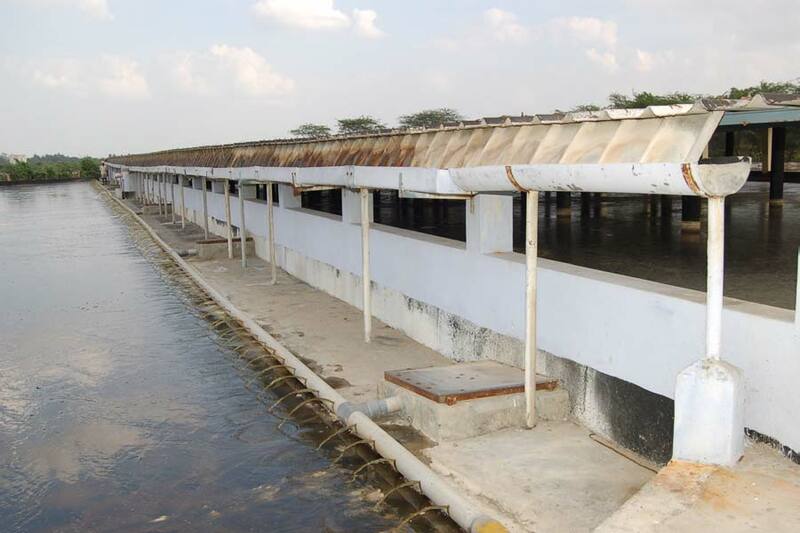 About 75% of the effluent treatment facility space is released. This very valuable real estate structural space is now being used for other productive uses. * These figures are estimates from the research team's experience. The Phycoremediation plant currently deployed at SNAP Alginates is operating stably from september 2006. Dr V Sivasubramanian and his team is woking on further improvement of the technology to suit the needs of various types of effluents.